This Independence Day weekend I went to Monticello, and there I bought Douglas Wilson’s Jefferson’s Books, a delightful monograph that shows us Jefferson as the remarkable book collector and reader that he was. Much of it deals with his decades-long, setback-ridden (fires! thieves!) building of his library, whose 6,700 volumes became the founding contribution to the Library of Congress upon his retirement. I have more, much more, to learn about Jefferson, but at least in the matter of books and reading, he may be my ultimate role model. Not that I want to build extensive, world-renowned libraries, but I want to dedicate myself to the systematic study of books to improve my knowledge and to share it with others and encourage them to read more – all things at which Jefferson excelled. 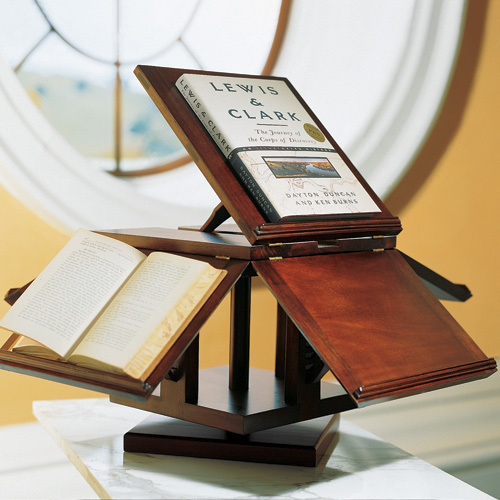 Below are some choice quotes from the book, a recommended reading schedule he gave to a friend, and a picture of his revolving bookstand, one of the coolest (okay, maybe cool isn’t the right word here) items in his Monticello house.